Not far from Oxford there was a wood. In the middle of the wood was a long green slope, and on sunny days someone used to ride his tricycle very fast down the slope. It was Big-lugs the Wallip. Sometimes he would take his feet right off the pedals, and sometimes he would take his hands right of the handlebars, and sometimes he would even close his eyes. 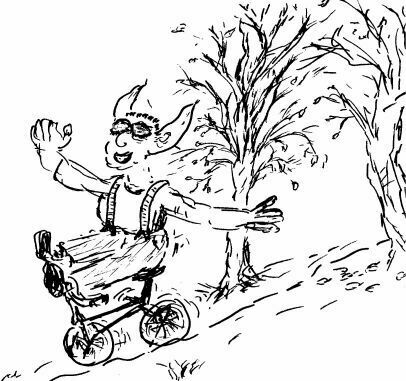 Now one day when Big-lugs was riding his tricycle very fast down the slope, with his feet on the handlebars and his arms spread out wide and his eyes closed, singing a song, the tricycle bounced over a stone, and Big-Lugs bounced right off it and fell, BUMP, on his bottom among the dead leaves. 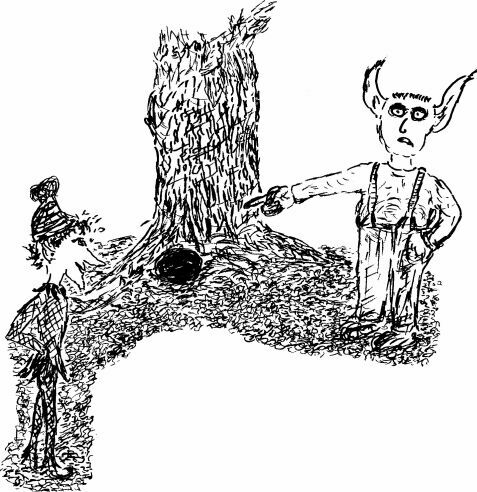 The tricycle ran off down the slope all by itself, straight for the big oak tree at the bottom. Big-Lugs was afraid it would crash into the tree and be smashed to smithereens. But it didn't. It went down the rabbit hole under the tree. 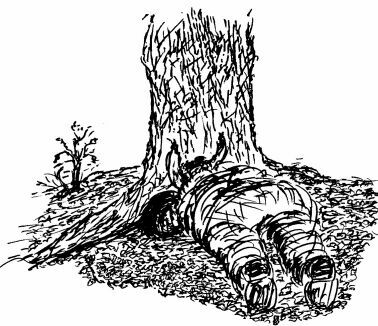 Big-Lugs ran down the slope and peered into the hole, but he couldn't see anything. It was too dark. He stretched his arm into the hole as far as he could reach. But he couldn't feel anything. It was too deep. So Big-Lugs the Wallip lay down on the ground and big wet tears began to run down his nose. Soon someone came through the wood. It was Sly the Goblin. "Hello, Big-Lugs," he called, "why are you crying?" "Because I can't get my tricycle back from down the rabbit hole," said Big-Lugs. "What's it doing down the rabbit hole?" asked Sly. "Well," said Big-lugs, "I was riding down the slope with my feet on the handlebars and my hands spread out wide apart and my eyes closed, singing a song, when, BUMP, my tricycle bounced over a stone and I bounced right off and fell on my bottom among the dead leaves and my tricycle ran off down the slope all by itself and vanished down the rabbit hole." Sly the Goblin laughed and laughed. "You're a wallip!" he said. "I may be a wallip," said Big-Lugs crossly, but that's no reason for you to be so rude. I'm going to kick you and punch you." 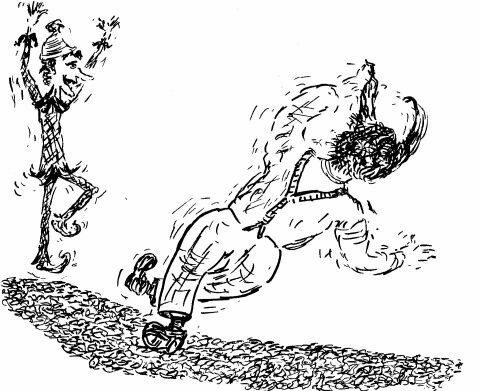 "You'll have to catch me first," jeered Sly, and he danced round Big-Lugs so quickly that Big-Lugs got his feet tangled together and fell over on to his nose. Sly skipped off through the wood laughing and jeering "You're a wallip, you're a wallip!" and Big-lugs lay there with more tears trickling down his big wet nose. Soon someone else came through the wood. It was Delilah Damson. 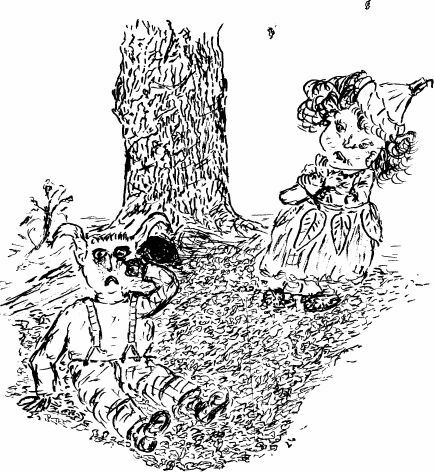 She was a rather sour little fairy, but she had read all the Victoria Plum books and wanted to be sweet and kind. "Why are you crying, Big-Lugs?" she asked. "Because I can't get my tricycle back from down the rabbit hole." "Why is it down the rabbit hole?" "I was riding down the slope with my feet on the handlebars and my arms spread wide apart and my eyes closed, singing a song, when BUMP, my tricycle bounced over a stone, and I bounced right off and fell on my bottom among the dead leaves and my tricycle ran off down the slope all by itself and vanished down the rabbit hole." "You're a wallip," she said. 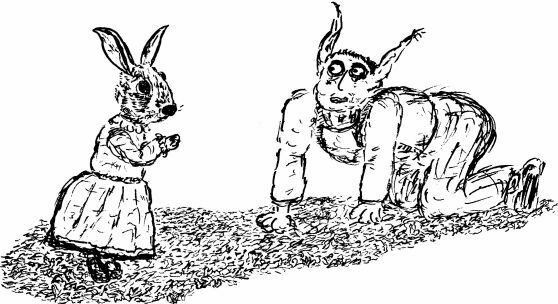 "I may be a wallip," said Big-Lugs crossly, "but that's no reason for you to be so rude. I'm going to kick you and punch you." Big-Lugs started to get up, and Delilah remembered she was supposed to be sweet and kind. "Wait a moment," she said, "Perhaps I can get it back for you with a magic spell." "Will it work?" asked Big-Lugs. "Of course," replied Delilah. "All you have to do is to close your eyes and think of your tricycle. 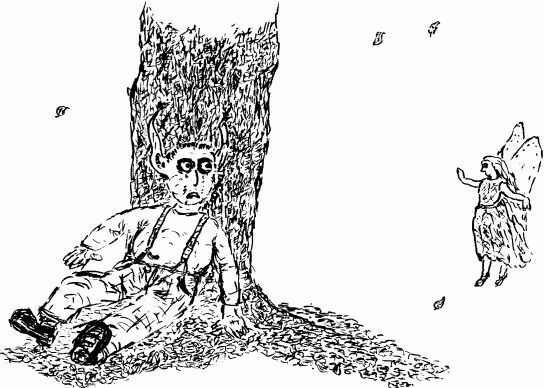 Concentrate as hard as you can, and try to imagine it popping up out of the rabbit hole and landing in those dead leaves." So Big-lugs shut his eyes and concentrated as hard as he could, while Delilah muttered her magic words. 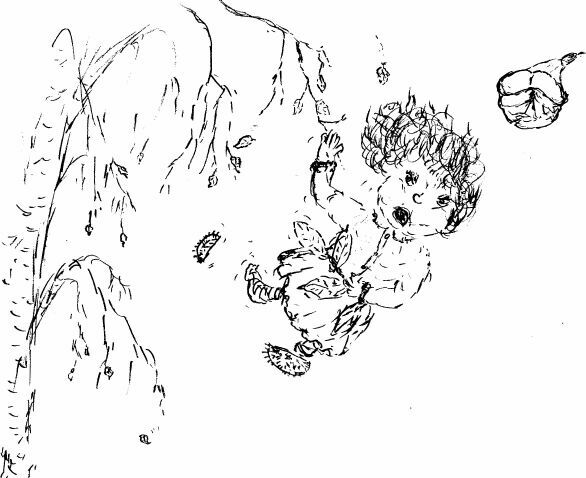 Then she waved her wand, and HEY PRESTO, Big-Lugs found himself flying through the air. 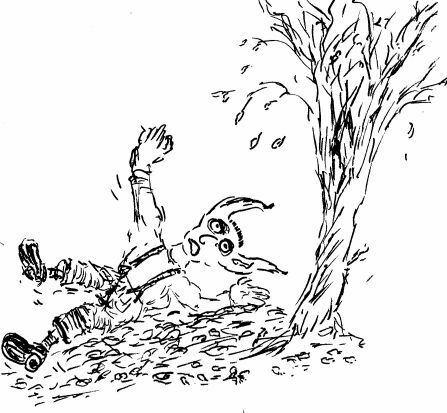 He turned over three times and landed, bump, on his bottom among the leaves. Delilah Damson laughed and laughed. Big-Lugs got up and rushed at her, but she flew up out of his reach and he fell over with another bump on to his nose. "You're a wallip, you're a wallip!" she jeered and flew up to the topmost branch of a nearby birch tree. It was a thin little branch, and she was a fat little fairy, so the branch bent, Delilah slipped off, and before she knew what was happening she fell with a bump among the leaves. Big-lugs laughed, but he soon remembered his tricycle and more tears rolled down his nose. Soon someone else came walking through the wood. it was Mr Badger. "Why are you crying, Big-Lugs?" he asked. Big-lugs sighed. "I was riding along," he said, liwith my feet on the handlebars and my arms spread wide apart and my eyes closed, singing a song, when, BUMP, my tricycle bounced over a stone and I bounced right off and fell on my bottom among the dead leaves, and my tricycle ran off down the slope all by itself and vanished down the rabbit hole." "You're a wallip," he murmured. "Oh no you're not," said Mr. Badger, "and I'll tell you why you're not. Because I'm bigger than you and I'll hurt you more than you hurt me." So Big-lugs sat quite still. "And another thing," said Mr. Badger angrily," if you hadn't been so rude I might have been able to help you get your tricycle back. I'm very good at digging, but I'm not going to help you at all because you're a rude little wallip." Mr Badger went off muttering and grunting to himself, and Big-lugs lay there sadly, with more big wet tears rolling down his big wet nose. Soon someone else came along the path. It was Fritillaria, the Oxfordshire Tooth Fairy. She had left her assistant, Kevin, the Tooth Elf, in charge of the office while she went for a walk in the woods, and she was enjoying the fresh air and trying not to think about the muddles Kevin would be making. When she saw Big-Lugs she came over to him. "What's the matter Big-lugs?" she said, why are you crying?" "Because I can't get my tricycle back front down the rabbit hole." "Why is your tricycle down the rabbit hole?" asked Fritillaria. "I was riding along," growled Big-Lugs, "with my feet on the handlebars and my arms spread wide apart and my eyes closed, singing a song, when, BUMP, my tricycle bounced over a stone and I bounced right off and my tricycle ran off down the slope all by itself and vanished down the rabbit hole, and Sly the Goblin laughed at me and called called me a wallip and Delilah Danson did a spell that went wrong and laughed at me and called me a wallip, and Mr Badger told me off and called me a wallip and if YOU call me a wallip I'm going to kick you and punch you, so there!" "Don't be so rude," said Fritillaria. "If you had been nicer I might have helped you to get your tricycle back - and my spells don't go wrong like Delilah Damson's - but you're too rude for anyone to help. You're a wallip!" Then she flew away, leaving Big-Lugs all alone again. More big tears rolled down his nose, but he began to think about what Mr Badger had said, and about how rude he had been to everyone who had tried to help him, and he felt very sad indeed and wished he could be a better wallip. So when he beard someone else crying in the bushes he decided to go and help. It was little Miss Bunny, and she was very unhappy. "What's wrong, Miss Bunny?" said Big-Lugs, "Can I help?" 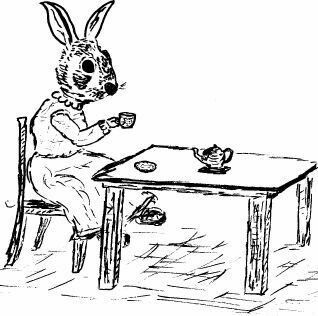 "Oh, it's terrible," sobbed Miss Bunny, "I was sitting in my little dining room having a nice quiet cup of tea when suddenly a terrible machine from outer-space came rushing in my front door and along the passage and knocked over my tea table. I was so frightened I ran straight out of the back door and didn't stop till I got to the edge of the wood, and I've only just got back, and I'm terrified to go into my little house because I know that terrible machine's still there." "Don't worry, Miss Bunny,'! said Big-Lugs, "I'll help you. I promise you the machine won't hurt you. If you go down into your house and push, and I'll pull from up here, and we'll soon have it out." "Oh, do you think so?" said Miss Bunny timidly. Big-Lugs smiled at her, and soon she felt brave enough to go down into her house. 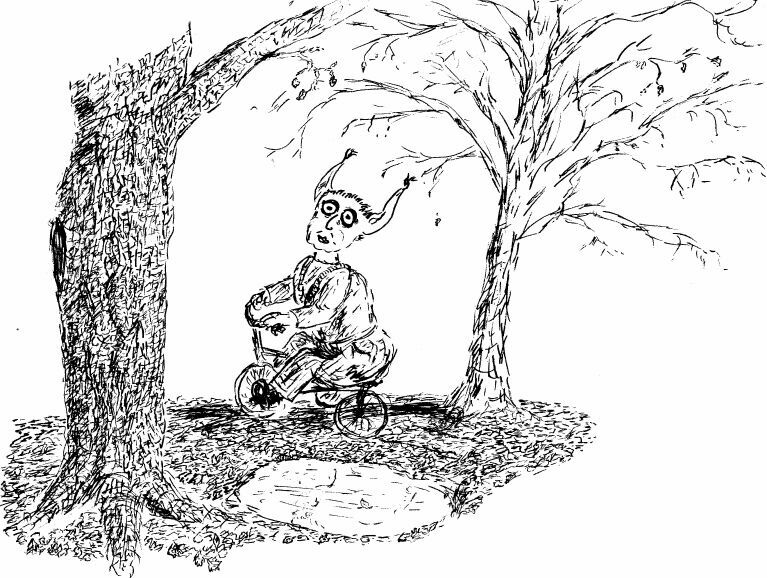 Miss Bunny pushed and Big-Lugs pulled, and soon the tricycle was out of the rabbit hole. Big-Lugs mounted it again and rode off home, very carefully, with his feet on the pedals and his hands on the handlebars and his eyes wide open. And as for Miss Bunny, she made herself another pot of tea. Please remember that this story is in copyright. See Copyright and Concessions to see what you may or may not do.